"Colleges are increasing their attention to the social aspects on campus to keep students happy; there is not enough rigorous academic instruction." - Richard Arum, NYU Professor of Sociology & co-author of "Academically Adrift" & "Aspiring Adults Adrift". Last Fall the American Council of Trustees & Alumni (ACTA) released their annual What Will They Learn report for 2014 – 15. 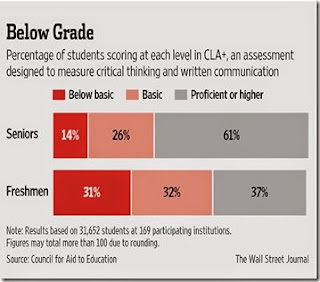 The report evaluates nearly 1,100 colleges & universities grading each school using graduation requirements centered around seven core subjects – composition, mathematics, literature, natural or physical science, intermediate-level foreign language, U.S. government or history, & economics. Seems only common sense to think that someone graduating from college would be proficient in these subjects no matter what their major was. But long time readers of RTE know this is not the case based on previous posts regarding ACTA's work. For instance less than two thirds of the schools require college level math, less than 20% require a foundational course in U.S. history or government, & just over 3% require even a single course in basic economics. At Harvard students can fulfill their literature requirement with "American Dreams from Scarface to Easy Rider" & @ the University of Colorado-Boulder students can take "Horror Films & American Culture" or "America Through Baseball" in lieu of an American history course. similar deterioration @ the high school level – having poorly educated high school graduates show up in college contributed to the dumbed down college curriculum. The result is a workforce that is unprepared to compete in the global economy for jobs that require either a high school or a college education – specifically, the above graph shows that four in ten college graduates do not possess the reasoning skills to handle work that requires a college degree. High tuition & student debt loads only add to the vicious circle of equally undesirable alternatives – get a college degree @ high current costs with no employment prospects or move in with your parents (with or without a college degree). See graphs below. The ever higher tuition costs are a direct function of the government providing student loans (i.e., subsidies) – tuition goes right up in lockstep as government money for student loans increases. 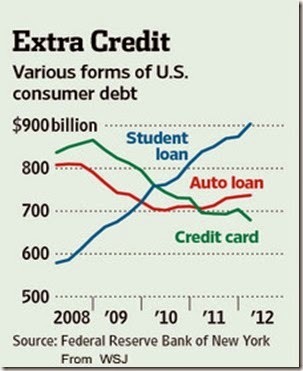 Getting government out of the student loan business will break the upward tuition cost spiral & getting government out of the economy in general will allow the free enterprise system to flourish so there will be jobs waiting for America's youth upon graduating high school, vocational school, or college. But ACTA's contribution is helpful in any environment. If you are a high school junior or senior or know of one (like your children or grandchildren) the What Will They Learn? website is the place to start if you want to go to college, think you can't afford it, or otherwise are just concerned about the cost & quality of the schooling. The website will show you that an Ivy League school like Brown University with an annual tuition of $45,612 is graded F, not requiring even one of the above seven core subjects in order to graduate; Harvard & Yale with annual tuitions of over $42,000 are both graded D; while the University of Georgia with an annual tuition of $10,262 in-state & $28,472 out of state is graded A. Starting your search with the ACTA website can save tens of thousands of dollars in tuition & fees while helping you find a college that, upon graduation, furnishes an education where you don't have to run – you can walk past the competition for jobs. ". . .that the right & the obligation to work is one that's shared by everyone in this country regardless of how they came here, regardless of status, I would prefer that they be participating in the workplace than not participating in the workplace." - BO's Attorney General nominee Loretta Lynch speaking @ a confirmation hearing before the Senate Judiciary Committee on January 28. "Do they have the right to work? They should not be in this country illegally." – Senator John McCain responding to Lynch's above statement. Despite 257,000 people finding employment in January the government's headline U-3 unemployment rate increased from 5.6% to 5.7% – but this increase was mostly due to the arithmetic involved because previously discouraged workers who had dropped out of the labor force returned. This indicates once again that a more thorough analysis than just reporting one number is needed to understand the unemployment picture in the U.S. Highlights from the Department Of Labor - Bureau Of Labor Statistics (BLS) report for January were 1) the broadest measure of underemployment, U-6, increased from 11.2% to 11.3% in January & 2) the people listed as multiple jobholders, representing 5% of those employed, increased by 604,000 (year to year) – an indication of more people trying to make short ends meet & the growing affect of ObamaCare's rules defining full time employment & eligibility for employer paid healthcare insurance as 30-hour workweeks. In essence people need income from more than one of these types of jobs to live on. So the stagnate depressed incomes & underemployment continues with many people in their fifties realizing they will never work again as BO's world cruelly passes them by – these are the people who will be tempted to take reduced Social Security benefits when they turn 62 thereby leaving them with possibly 20 to 30 years of inferior cash inflows when they will surely need money & medical care the most. But Karen Ziegler & Steven Camarota of the Center for Immigration Studies (CIS) recently revealed the most disheartening part of the last few unemployment reports by showing that all net new jobs since the start of the Great Recession have gone to workers classified as foreign born (i.e., immigrants – legal & illegal). 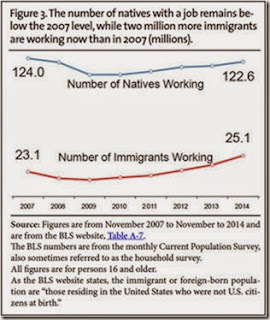 See graph above & the CIS study entitled "Despite Recent Job Growth, Native Employment Still Below 2007 - BLS data show all net employment growth has gone to immigrants." The CIS study provided the data below from November 2007, the month before the Great Recession began, through November 2014. I provide the data for January 2015 from the BLS table A-7 pertaining to the Household Survey. All figures are in thousands. LF means Labor Force. 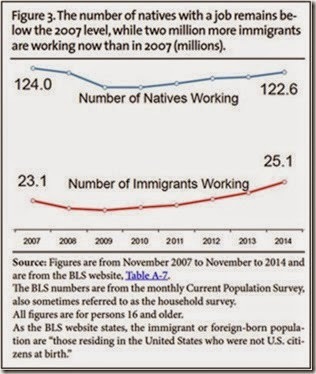 Highlights of data from the above table: 1) between November 2007 & November 2014 there was an increase of two million adult (16+) immigrants (legal & illegal) working while during the same time there was a decrease of 1.46 million native-born people employed, 2) although all of the employment growth has gone to immigrants, natives accounted for 69 percent of the growth in the adult population from 2007 to 2014, 3) 45 percent of employment growth has gone to immigrants the last two years (November 2012 to November 2014), though immigrants comprise only 17 percent of the labor force, 4) the number of natives not in the labor force (neither working nor looking for work) continues to grow, & 5) the number of adult natives not in the labor force actually increased by 693,000 over the last year, November 2013 to November of 2014 & increased by 11.1 million from November 2007 to November 2014. Dr. Camarota points out that the immigrant workers listed in the above table covers the entire spectrum from janitors to executives so it is not just those doing jobs Americans don't want to do that are becoming employed. In total there were 79.8 million adult natives and 13.9 million adult immigrants who were not in the labor force in January 2015 & an additional 9.5 million immigrant & native adults who were officially unemployed so there is no labor shortage in America. On June 27, 2013 sixty-eight senators (including 14 Republicans) passed S.744 – the Senate's 1,200 page immigration reform bill written principally by New York's Senator Chuck Schumer working in close direct coordination with BO's staff including former La Raza senior vice president Cecilia Munoz. S.744 will allow 33 million foreign citizens lifetime work permits over the next ten years. Source – Roy Beck, NumbersUSA. The Senate bill did not become law when it was stalled in the House in 2013 but many politicians still talk about it & would like to bring it back. 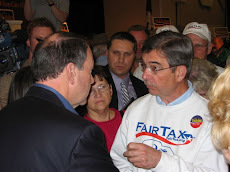 It falls into BO's overall plan to fundamentally change America for the worst that he would promote such a bill as S.744 & would nominate someone to be Attorney General (see above quote) who sees nothing wrong with ignoring the immigration laws & accordingly sees nothing wrong with the data in the above table. The biggest mistake in every Republican immigration control plan I have ever heard is that they always start with "secure our borders." No - the first point is to determine if we want illegal immigrants in America or not – are we better off with them here? Starting with "secure our borders" takes for granted that all eleven million people in the country illegally are here to stay one way or another which is exactly what BO & the Democrats want. The employment information in this post provides information to help you decide – as a starting point. Below is my letter that was published today in the WSJ that responded to a letter expressing concern that the federal gasoline tax had not been raised since 1993. The writer of that letter asked who today would be willing to live on what they made in 1993. I used the above graph to point out that many senior citizens don't live on such a fixed income – they live on a declining one. In "Let's Grow Up and Raise the Gas Tax" (Letters, Feb. 2), Chris Daly asks who today would be "willing to live on what they made in 1993?" 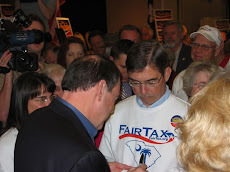 He makes the point that the federal gasoline tax hasn't increased in 22 years and accordingly an increase is needed to keep our interstate highways in good repair. Mr. Daly's question describes exactly what many senior citizens living on Social Security and CD interest income face today. In 1993 five-year CDs yielded 5% and even had a few bounces up until 2000 when rates began to drop to the current 1% level—an 80% decline. 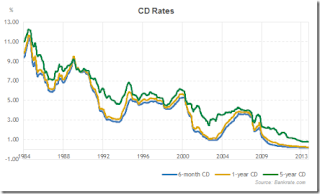 If you assume that 50% of a senior's income is indexed to inflation through Social Security and the other 50% has experienced an 80% decline in 2000 dollars, we are asking seniors to live on less than 60% of their former income, especially considering that the CD interest income was never indexed to inflation. Wealth spend down of the original principal has also obviously occurred in order for seniors to maintain any semblance of a consistent standard of living. Highways can receive funds from tolls (e.g., N.J. Turnpike), state excise taxes and general revenue—financed of course from subsidies received from senior citizens lower interest income that has been lowered over the years by the artificial manipulation of the Fed.